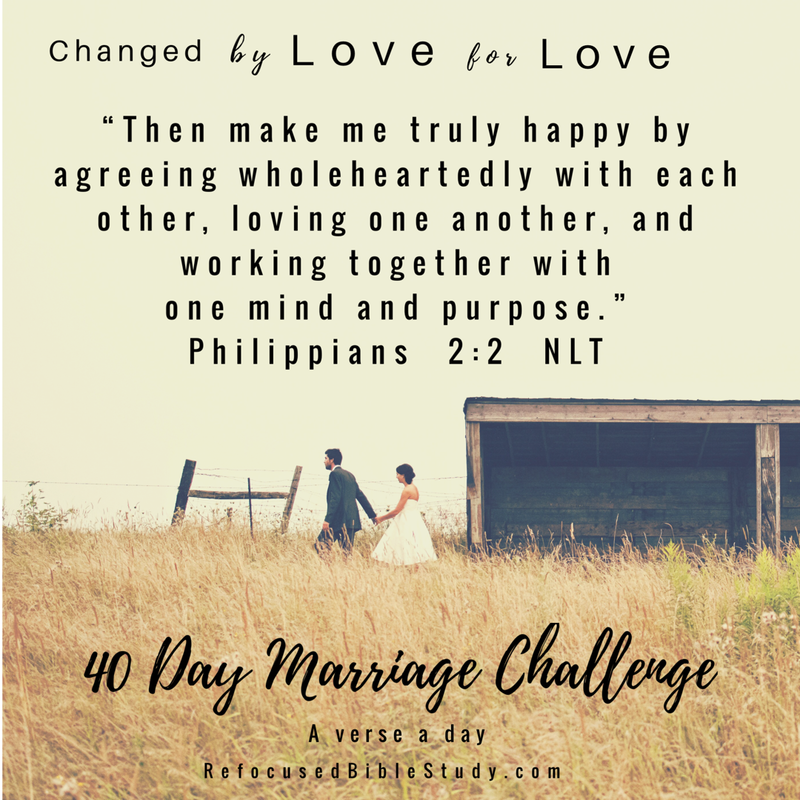 It’s day 10 of the 40 Day Marriage Challenge here at Refocused Bible Study. Today’s verse gives us a powerful plan to be a dynamite couple for God’s kingdom. What are we having trouble agreeing on? Pray and ask God to help you settle it. Love grows deeper and is unhindered when it doesn’t have its own agenda. Be on the same track; with the same goals. (Think best friends on the same team). With God’s Spirit working through your oneness you are dynamite for God’s kingdom- unstoppable. E- End in prayer- Lord, I want ___________ & I to be a dynamite couple for you, to be ONE truly in all areas, like we were created to be in the garden. Thank you for (husband’s name) _____________. Thank you for marriage. Please help us agree, love, and work together with one mind and purpose: to grow your kingdom. I see you partnering us in these endeavors:____________ (list – starting with parenting and add all other assignments the Lord has you on currently). Please continue to grow our oneness and Spirit, makes us dynamite. In Jesus’ name, Amen.